Chamlian Open House Brings Record Number of Prospective Students! Another successful Open House! Our principal, Dr. Kargodorian, began with her opening remarks. 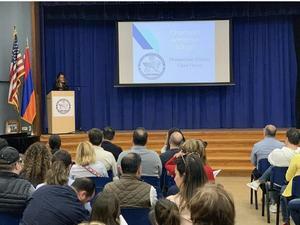 Prospective parents were given a presentation of the multi-faceted, rigorous, and dynamic foundations of Chamlian, followed by a tour of our beautiful facilities. At Chamlian, we are always promoting academic excellence, preserving the Armenian heritage, and developing students of high integrity in an innovative, safe learning environment.